A sailing holiday in the Mediterranean is a perfect vacation but why not add a few days ashore in a hotel afterwards. Some of your crew may want to try their hand at watersports that are easier to arrange at a hotel rather than from your yacht, such as dinghy sailing, windsurfing or diving. Some of your crew may want time to just relax by the pool, on the beach or in the hotel spa. Keep everyone happy with a Sail & Stay Holiday! A small, family friendly hotel with 32 rooms on the beach at Nikiana. An abundance of activities means you will never be bored! Dinghies, windsurfers and paddle boards are available and the club sailing team offer advice and regular sailing clinics for beginners and intermediates. Mountain biking trips offer a nice alternative to life on the water. For those wanting a more relaxed stay, enjoy the fresh water pool and traditional Greek taverna. Combine with your bareboat charter from Lefkas or Palairos or with the Ionian Flotilla. Conveniently located across the road from Kalamaki Marina, this is the perfect choice for a few nights before or after your bareboat charter or flotilla from Athens. 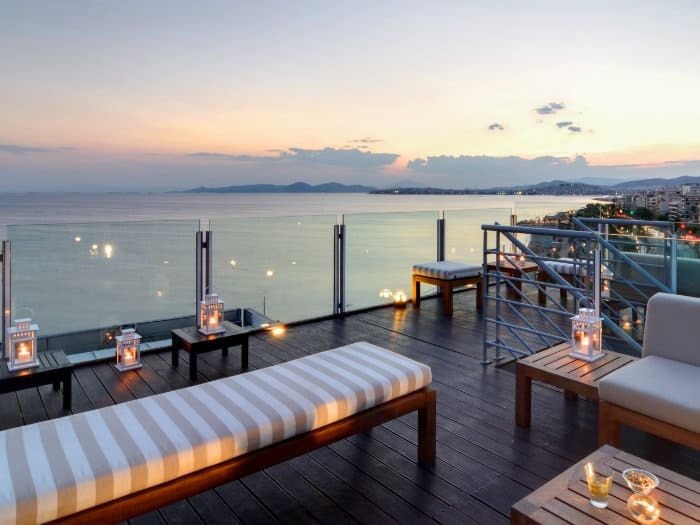 Hotel Poseidon has modern rooms, a beach bar and rooftop swimming pool. Located just 20 minutes from central Athens by taxi, tram or bus, a stay at Poseidon makes exploring the historic sites easy. "A great holiday! The boat was excellent, well maintained and spotless. The transfers to and from the airport were excellent also. Good sailing area with plenty of options for mooring and quays. Thoroughly enjoyed and will no doubt be booking with Nautilus again next year."